Best Used For: Attracting and disposing of flies. Don't fuss with messy fly traps. This convenient disposable bag trap is a better choice for easy catching and clean disposal of flies. Are flies taking over your back yard, forcing you to move your guests inside? Take back your yard with our highly effective fly trap! Hang our Victor® Poison-Free® Fly Magnet® Disposable Fly Traps around the perimeter of your property to keep your flying insect problems away from your home and outdoor living area. This fly trap attracts house, barn and bottle flies. It contains the best bait formula available on the market. No cutting or assembly required and the hanging mechanism is included!! This bag trap is easy to use - just add water and hang, then when full, just snap top onto trap to seal and place in trash. It's that convenient and that easy! Pull string to open trap. Add warm water to fill line. Hang trap onto tree branch or other suitable hanger. Flies are dormant until temperatures reach 65 degrees F.
Flies search for food at low sources. Traps are most effective when placed 24 inches or less from the ground. Works great. I put out two m380 and within 2 hours they were half full. Only problem I have is what to do with the fly's I catch. Some are still alive. If I could put 0 I would. We have used your product to take care of seasonal pests and it doesn't work any better than hanging up a strip of sticky tape. We put up four strips 7 days ago and there is not one fly stuck on your product. Stop taking peoples money saying your product catches flies. It doesn't. We apologize for this experience and would like to learn more. For further assistance, please feel free to contact our Consumer Relations Team at 1-855-5-VICTOR (1-855-584-2867). We are happy to help. As stated elsewhere it takes a day or two to get going, and it does smell but it did not smell as bad as we were prepared for it to. It has lasted all of a week and has caught thousands. I have to throw it out as there is no room for flies to go into the bag.My only recommendation is if you have a lot of flies go for the quart(M380) or gallon(M383) product that is reusable and can be re-baited. The best product for easily catching and killing outdoor flies in summer. Using it will also cut down on future flies. I see some one- and two-star reviews and the only explanation for the product not working is that the instructions were not read and followed. I have to buy it through Amazon because my local stores can't keep these in stock. Add warm water to the plastic bag, and give a little light shake to mix the powder solution into the water, then hang up outside. You will be shocked at the number of flies it catches and kills. Also, in my yard, because so many flies were exterminated it cut down on the future fly population that would have resulted from reproduction. The product does stink, and that's what attracts the flies so don't hang it near the BBG grill. The hanging catcher also is easily disposed of - be sure to snap down the yellow plastic top into the holes and the bag will be sealed for throwing into the garbage. Also be sure to replace with a new fly magnet at some point because there will be too many dead flies in the liquid for the scent to still be attracting new flies. Most importantly, Read All The Instructions. 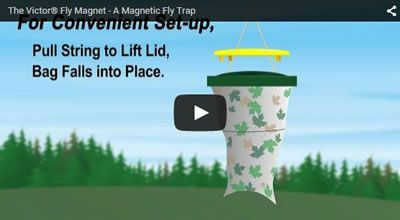 Buy the fly magnet, and take back your backyard. I don't know if this product is going to rid my yard of flies but I put out two traps yesterday and they have caught 100's of flies already. I plan on going to get a couple more today and spread them out in the yard. People say that this product smells but I haven't been able to smell it at all. The bait when you first put it in the container doesn't smell too great but once you add the water that smell goes away. Maybe it starts to smell if you leave the dead flies in there too long? Anyway, it really does work and it is fun to watch. I wish someone would post a video on YouTube! I just might have to do it myself. Stinky, but worth the smell! I wish I'd have found these a long time ago. Setting the trap up is very simple and it lasts about a week here in Ohio. I will continue to purchase these traps form Amazon.com because this is the only place to get a great deal. Very pricy through other retailers. Q.Does this work on mosquitoes and Noseeum’s? This product will only attract flies. Q.Can I put the disposable magnet fly trap in my house? This product is designed for outdoor use only to keep flying insects away from your home and outdoor living area. We do not currently have a dealer for Saudi Arabia. Please call us at 1-855-5-VICTOR (1-855-584-2867) for more information.